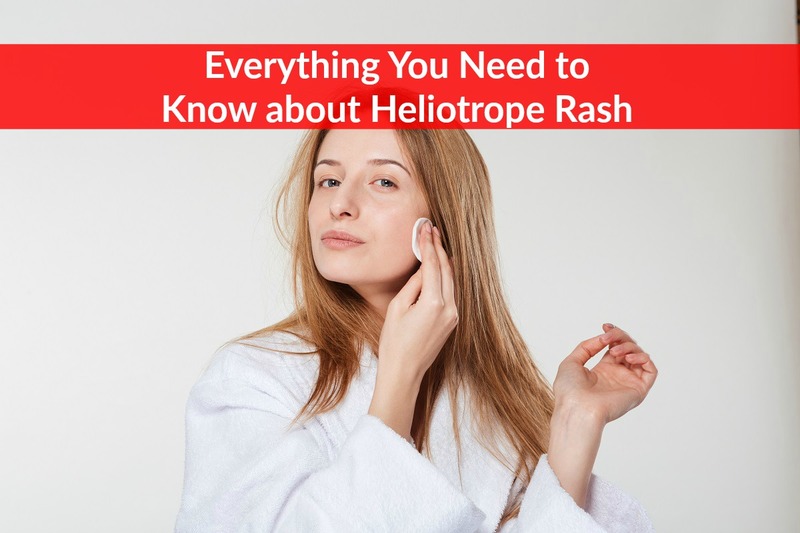 Home » Blog » Heliotrope Rash – what can we do about it? Imagine you wake up one morning with an itch around your eyes. As the day progresses, that itch turns into red, swollen patches. Anytime this happens, it can cause a lot of anxiety. Unfortunately, you might have something called Heliotrope Rash. Heliotrope rash isn’t a common name, but its effects can be unnerving. So how do you know that this might be your condition? And what do you do when you suspect you have it? Here is information that can help you in deciding if you might be suffering from this rash and what to do if you are. This is a persistent inflammation of the skin and possibly the muscle underneath. Heliotrope Rash is named after the tendency of plants to develop towards the sunlight. In adults, most cases occur around the age of 50. In children, peak age is about five to ten years old. The causes are largely unknown, though the best theory is that it is an autoimmune reaction to an initial viral infection or some forms of cancer. Most people who receive the diagnosis survive, though with ongoing infection develop further muscle weakness. The older you are when you receive the diagnosis, the more likely the condition is accompanied by other more serious conditions, reducing the outlook of treatment. The rash itself is the first sign that you might have this condition. A Heliotrope rash is reddish or often violet colored. It develops across the eyes and face, but may also show up around the joints such as the knuckles, the shoulders, back, and chest. The rash develops over time and grows progressively more swollen and irritated. It may change color from red to an intense purple. The skin turns blotchy and the rash is exacerbated by exposure to sunlight. The rash has different names depending on the coloring and location. (3) A Shawl sign is a covering over a wide area of skin. Similarly, the V sign appears as a wide covering in a V shape over the chest. Gottron’s sign develops over joint areas, particularly the knees, elbows, and knuckles. It’s a flat red rash. 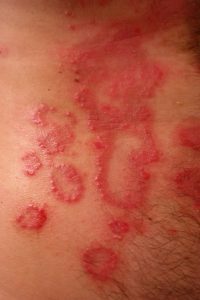 Gottron’s Papules appear in the same places but are raised instead of flat. Mechanic’s hands is a rash appearing on your hands. They look dirty because of the cracked skin and harsh red color. The nails are brittle and develop uneven edges, lending them the look of someone who works in manual labor. One of the main signs that it’s Heliotrope Rash is muscle weakness. (4) Muscle inflammation causes some loss of functionality while the skin inflammation spreads. Muscles next to the torso are highly affected and weakness progresses in a systemic pattern. There may also be pain and tenderness or swelling. If the muscle weakness progresses further without treatment, you might experience loss of feeling and activity in your esophagus. This will make swallowing very difficult. It’s also possible that if it progresses further or is left untreated, you can develop something called aspiration pneumonia. Initially, diagnosis is made from exterior examination of the affected areas. Doctors are able to assess fairly well the type of rash from its distinct features. Once an examination has been made, there are a few different tests to run to understand the scope and severity of the rash. The first test is something called a “biopsy” where a sample of the affected skin is taken and sent to a lab. (3) The lab then confirms a diagnosis. Other tests are done in order to determine possible causes of the inflammation. These tests differ based on the age of the patient and suspected causes. Many of them involve testing the blood or x-raying parts of the body to identify the underlying cause. Unfortunately, there’s no cure for heliotrope rash because of the underlying causes. However, there are things you can do to alleviate some of the symptoms and prevent worsening the rash. First, it’s important that you wear sunscreen or stay out of direct sun completely. Protective clothing is important as well. Exposure to the sun will worsen the rash. Another treatment is an anti-histamine ointment to relieve itching. (3) Anti-histamine cuts down on the immune response that triggers the rash. Using it regularly prevents the skin from being as inflamed. Other ointments are steroid based. Prednisone and corticosteroids help to reduce inflammation and fight the skin’s auto-immune response. Many patients see a huge difference in their skin tone and feeling after using steroids for a period of time and some see remission. Therapy is continued if the symptoms return. For severe cases, a patient might be prescribed stronger immunosuppressants to ease inflammation. If the rash is recurring and isn’t kept under control, these stronger therapies might offer relief. For accompanying muscle weakness, physical therapy is prescribed to prevent further muscle loss. (3) It’s important to build strength back to prevent injury due to compromised muscle control. Adequate stretching also helps relieve any soreness and further condition the muscle to improve control. Other types of physical manipulation might be necessary to reduce pain and regain strength. A rare few patients experience some calcification of the skin if the rash progresses untreated. For these patients, surgery may be necessary to relieve some of the discomfort associated with these areas. For most patients, however, surgery is unnecessary. The rash is usually managed quite well with topical prescriptions designed to minimize the body’s immune response. At the moment, heliotrope rash and its underlying causes aren’t fully understood. Recent studies have shown links to several autoimmune diseases as well as cancer, but this link isn’t fully established. One study showed a link between a tendency to Dermatomyositis and a genetic predisposition. Patients often show immunologic abnormalities as well. This abnormal T-cell activity may contribute both to skin sensitivity as well as muscle weakness. Drug-induced Dermatomyositis has also been found in patients with chronic forms of leukemia or essential thrombocytosis. (5) Drugs that trigger reactions consistent with heliotrope rash include certain statins and penicillins. 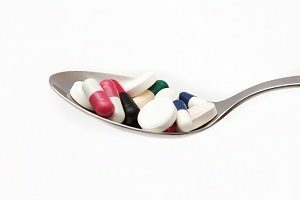 In cancer patients, anti-tumor necrosis factor drugs are also linked with the rash. Anecdotally, patients who received silicone breast implants or silicone injections have reported instances of heliotrope rash, but this hasn’t been verified by independent studies. The study didn’t seem to be affected by prescription of corticosteroids and immunosuppressant drugs. When a diagnosis is delayed, this further exacerbates the presence of the underlying malignant conditions. Catching the rash early causes relevant tests to be performed. Overall, this leads to better treatment and management of all underlying causes, not just the rash. If you are diagnosed with heliotrope rash, it isn’t the end of the world. It’s important that you see a doctor as soon as possible so that you can receive a diagnosis. The sooner you catch it, the better it will be for your health. There are therapies and prescriptions to help you manage the physical symptoms of the rash. Many people experience remission after the right therapy and regain the use of their muscles. Whatever the diagnosis, there is hope and help to ease the condition.